16 High Street, Evandale. Google Maps. As all the source materials (licensing lists, newspaper advertisements etc) only give the locality or town, it is difficult to tell if a hotel has always been at location or might have, in its earlier years, been elsewhere. 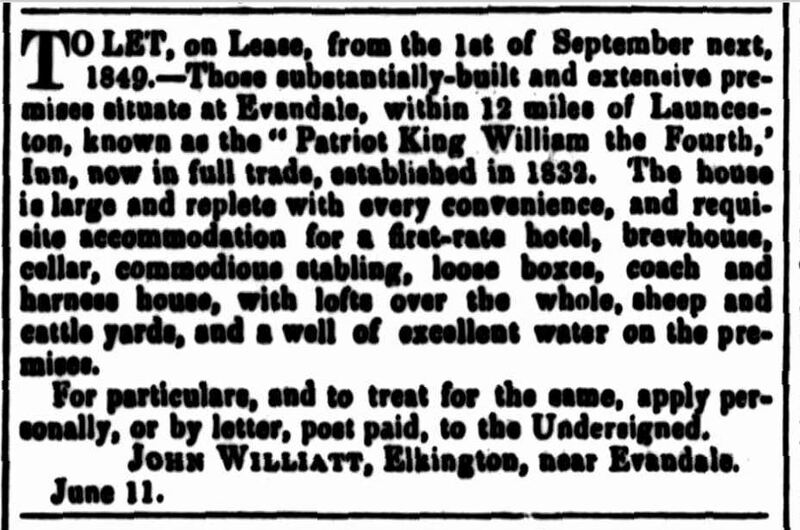 In this case, Karl von Stieglitz says John Williat had an inn at New River in 1832 that “was built on the 37.5 acre block on which his house, the Laurels, and also later ‘The Patriot King William the Fourth’, now Blenheim, were afterwards erected”, but at the bottom of the same page he says Blenheim “was built as ‘The Patriot King William the Fourth” in 1832, being licensed in October of that year”. So take that as you will. 1841-42 John Williatt, Patriot King, William IV. Evandale. 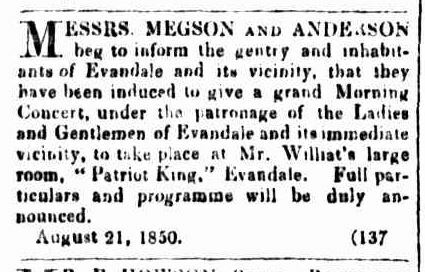 1871-76 Dinah Duffell, Patriot King Hotel, Evandale. J Williatt, Evandale ; Mr. Wales objected strongly to a license being granted to Mr. Williatt, and in a lengthy speech related in what manner he had been insulted by Mr. Williatt, who he said was in the habit of tampering with the constabulary, and by this means raising an opposition against him in his magisterial office, and thereby enabled to violate the laws with impunity. [snipped for length] After a prolonged discussion, interspersed with loud cries of order and chair, during which time a great deal of confusion took place, inasmuch as, by way (we presume) of getting through the business with greater celerity, every one spoke at once, the question was put to the vote, and Mr. Williatt lost his license by a majority of 12 to 8. 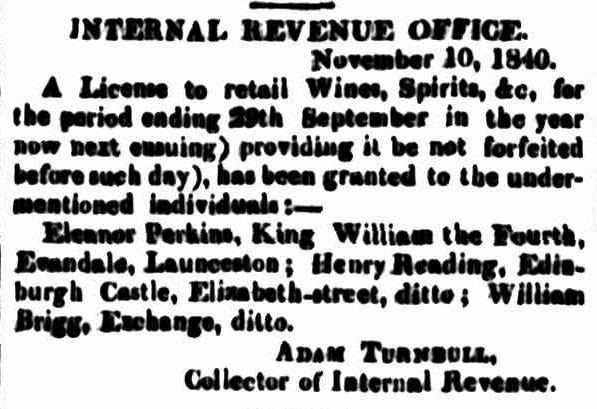 Article in Cornwall Chronicle addressing reasons for Williat’s licence being refused. 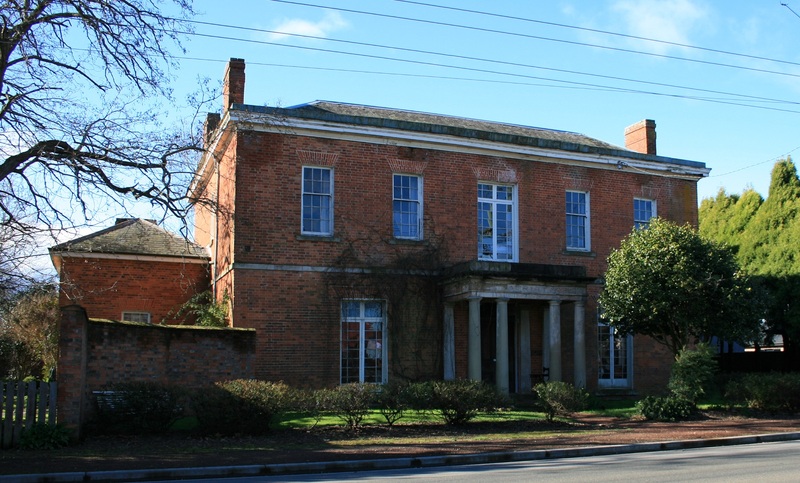 A license was granted to Mrs. Eleanor Perkins fur the house formerly occupied by Mr. Williatt at Evandale. Thomas Fall, Patriot King William the Fourth, Evandale.- First-rate character ; splendid building, and well conducted— Granted by acclamation. 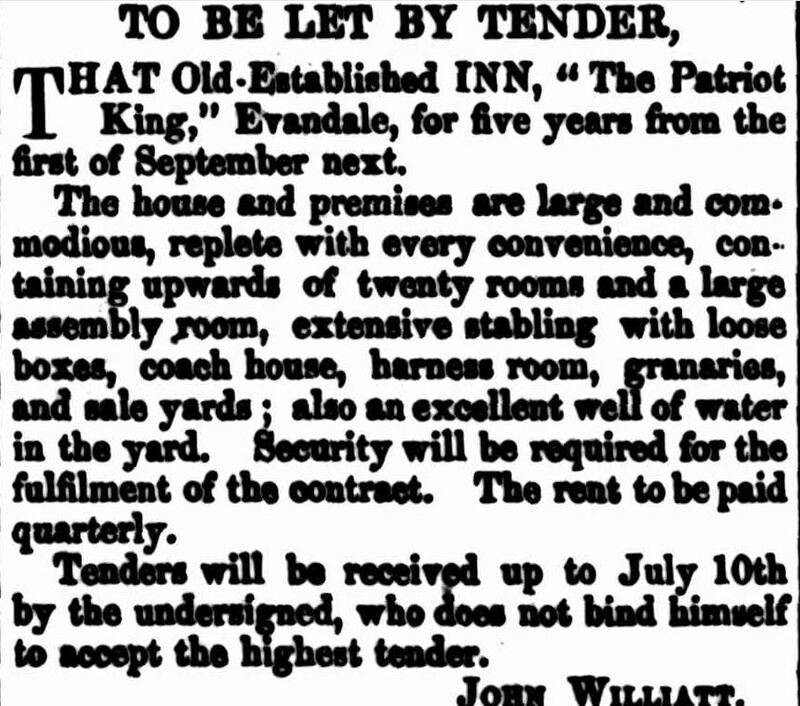 Mr. Thomas Fall’s application, as holder of the original license, The Patriot King William the 4th, for a transfer to the premises lately erected by him at Evandale — the applicant was refused on the ground that the transfer would be injurious to the proprietor Mr. Williat. Mr. Tarleton— “If you reject Fall as an original holder, you must consider him as a new applicant.” Ultimately a new license was granted to Mr. Fall, and Mr. Williat’s application for the transfer of the original license was allowed. 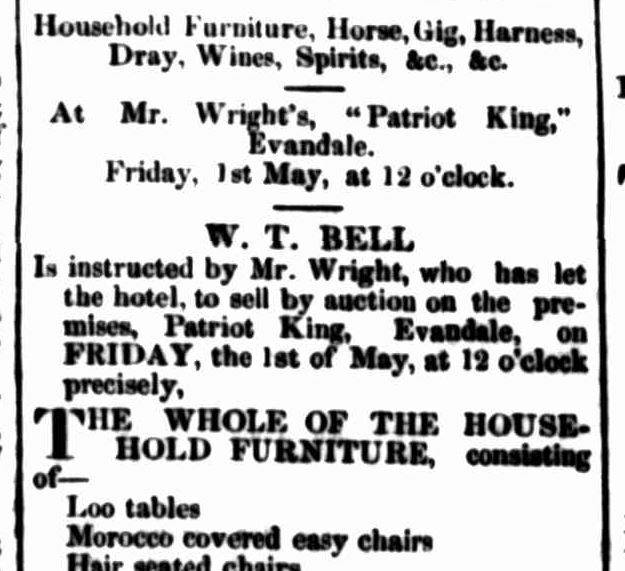 This day an information, laid by Mr. Chief District Constable Perkins against Mr. William Wright, the landlord of the “Patriot King Inn,” Evandale, for breach of the Sunday clause of the Licensing Act, came on for hearing before the Assistant Police Magistrate and J. R. Salmon, Esq., J.P. Mr. Wright pleaded guilty, and it being his first offence he was fined in the mitigated penalty of £2 and costs. The committee of the Evandale Cricket Club have been very busy the last few days in laying out, sowing with grass seed, rolling, and fencing about 40 yards square for a new wicket ground in the centre of the fine paddck on the main road adjoining the Patriot King Hotel, and which has been kindly lent by J. Williat, Esq., at a cricket ground for some years past. (Before, the Warden, W. Sidebottom, Esq., and Jas. Cox, Esq.). Possessing an Illicit Still.-Mrs Dinah Duffel, of the Patriot King Hotel, Evandale, pleaded guilty to having an illicit still in her possession, but in extenuation said she was not aware that it was a still. Fined £10 and costs. During the past few months the public mind at Evandale seems to have been seriously disturbed owing to alleged irregularities on the part of the ” powers that be” in their police administration. 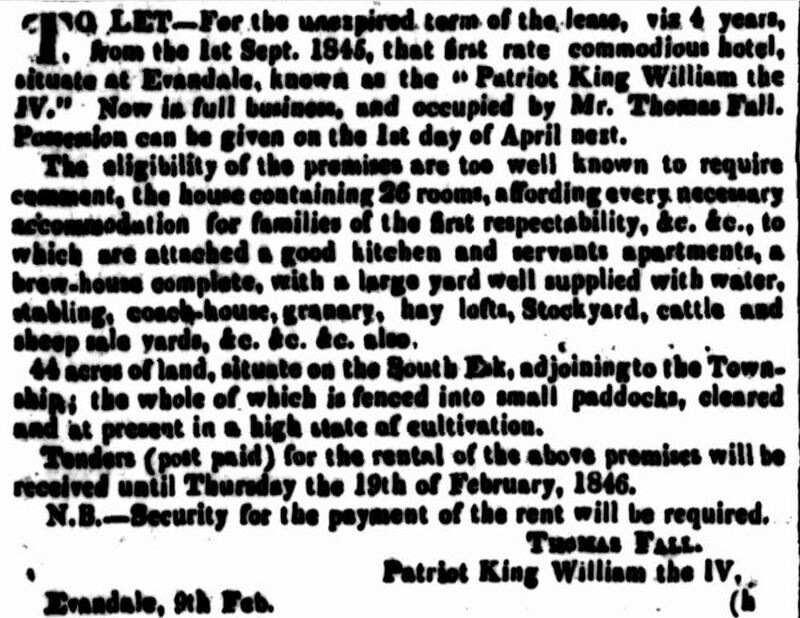 The facts which have come under our notice are briefly as follows :—Some few months ago in consequence of “information received,” Peter Smith, Sub-Inspector, accompanied by William Murnane, a petty constable of the Evandale police, proceeded to the house of Mrs Dinah Duffel, landlady of the “Patriot King Hotel,” one of the most respectable hostelries in the district, and seized an illicit still. A summons was duly issued, and Mrs Duffell appeared to answer it on the 30th of December, before the Warden and Mr James Cox, when she pleaded guilty, having first been given to understand that the prosecution was a pro forma one, and that the penalty be merely nominal, as it was perfectly clear that she was ignorant of the article in her possession—it having been left at her house by a Mrs. Brien. The Bench, however, much to the surprise of all, fined defendant £10. Some days afterwards a report gained currency on the township to the effect that “all was not right” in respect to the “still case,” and that if the defendant had not been induced to plead guilty an expose would have been the result. It was said that Constable Murnane had alleged that between the date on which the still had been seized, and the date on which the summons against Duffell was returnable, additions had been made to the still in order that good case might be made out; and that Murnane observing that the still was not the same state as when seized had -nformd the Superintendent that placed in the witness box -e would acquaint the Bench of the fact that additions had been made to the still. In consequence of this report becoming generally circulated throughout the district it was deemed advisable to institute an investigation. Rebuttal of reported allegations by Peter Smith, claiming he resigned to purchase Macquarie Hotel. THE LATE MR. JOHN WILLIATT. Another pioneer of this colony has been taken from our midst. Mr John Williatt died at his residence, Evandale, on Tuesday last, at the advanced age of 84. Always of an active turn, combined with perseverance and frugality, he long ago succeeded in acquiring a considerable amount of property. 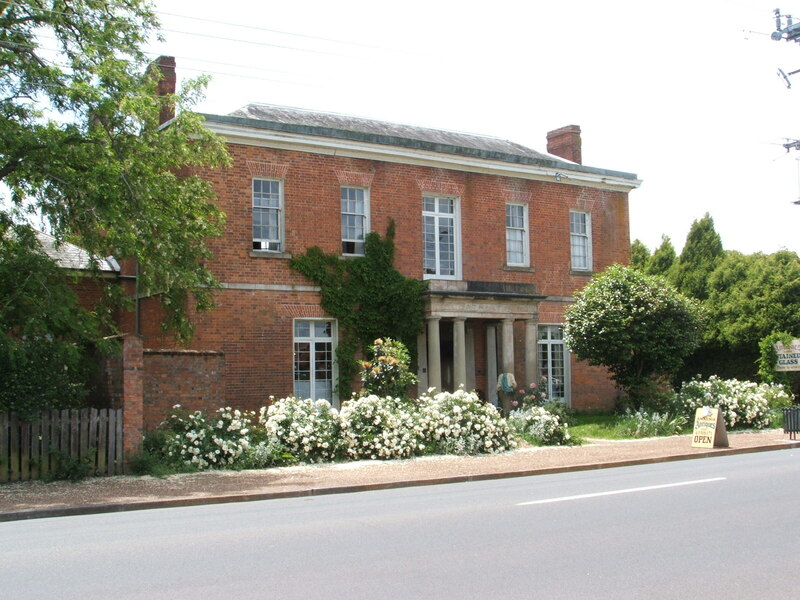 He built and for several years managed the large hotel at Evandale known as the “Patriot King;” and on retiring from that he superintended his farm at Elkington. During the last few years, however, the infirmities of age have incapacitated him for such pursuits, yet still he has been able until quite recently to drive into town and transact his ordinary business. Unassuming in his manners, and of a kind disposition, Mr Williatt was generally esteemed; and he was one of the very few remaining links that connected Tasmania of to-day with that of nearly half a century since. The funeral is announced to take place to-morrow afternoon at half-past two o’clock. The following article is printed in the North British Advertiser and Ladles’ Journal,” 5th February, 1876. Close to Evandale we had to cross a small river, only a foot and a half to two feet deep, with its pebbly bed showing up clearly in the shallow water. Our driver was extremely frightened when he saw it ; his alarm reached its height when the horses stopped in the middle to have a drink; and he vented a great sigh of relief when we arrived at Evandale. Here he again telegraphed to his father, and here we severed our connection with the coach, as we had now struck the railway — our driver bidding us good bye very early in the morning of the next day, “because,” as he said excitedly, “I’ve got to get over that ford you know.” At Evandale we took up quarters in an old-looking hotel, with a board dangling in front of it containing the sign and portrait of “The Patriot King, William IV.” The folks of the place were grumbling at the inclement weather. “No Melbourne people,” said they, “are coming over here at all; it’s far too cold them.” In Hobart Town they had been complaining of the heat. 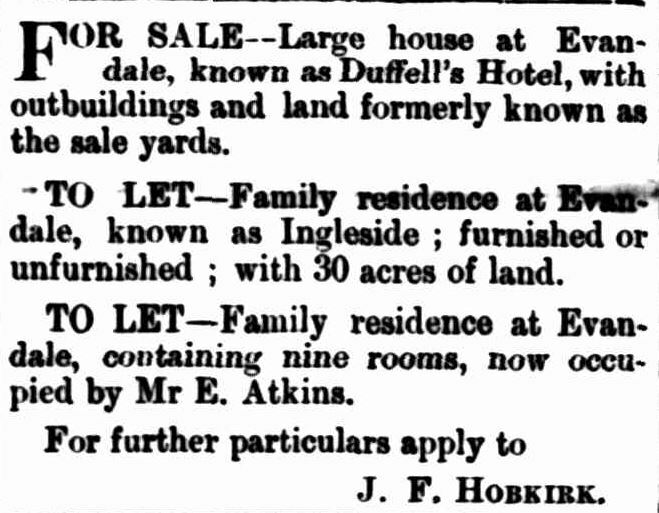 EVANDALE SALES We notice by advertisement that stock sales are still to be held in the in old yards, adjoining Mrs Duffell’s late hotel, which is now closed, Mr D. Collins having leased the house and premises for his private residence, using the extensive out premises as store room for grain and other produce, of which he is an extensive purchaser. 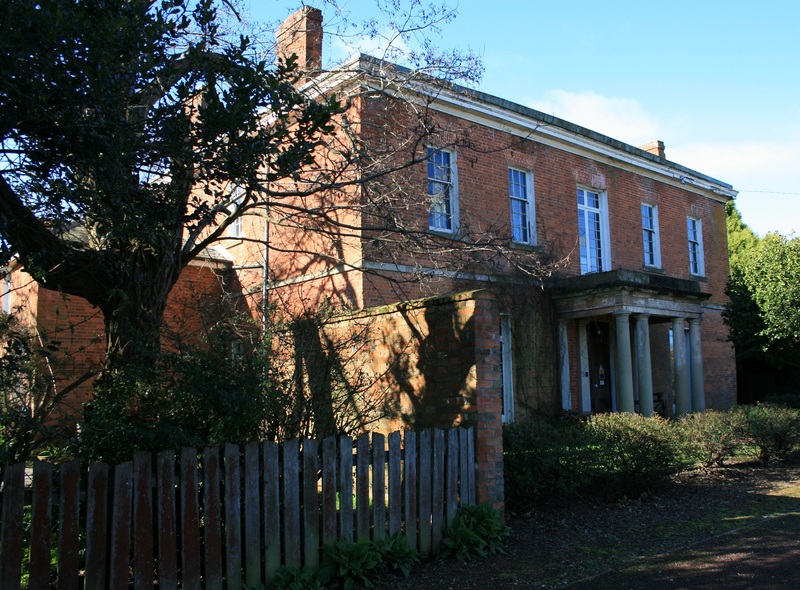 We believe arrangements are being made to secure the cottage at the entrance to the yard for Mr Bell’s use as Offices for settling up. 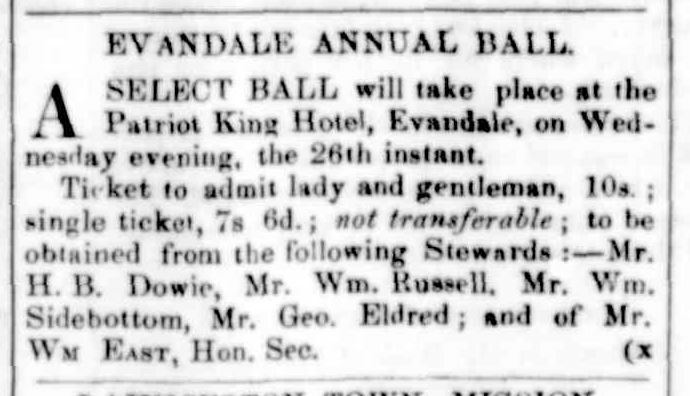 It was feared a great loss would be sustained and more inconvenience, caused., by the closing of this commodious hotel but we are glad to find Mrs Banks has taken a step in the right direction, by procuring the services of a well-known, groom) and also announcing first class luncheon on sale days. No. doubt she will be well patronised. 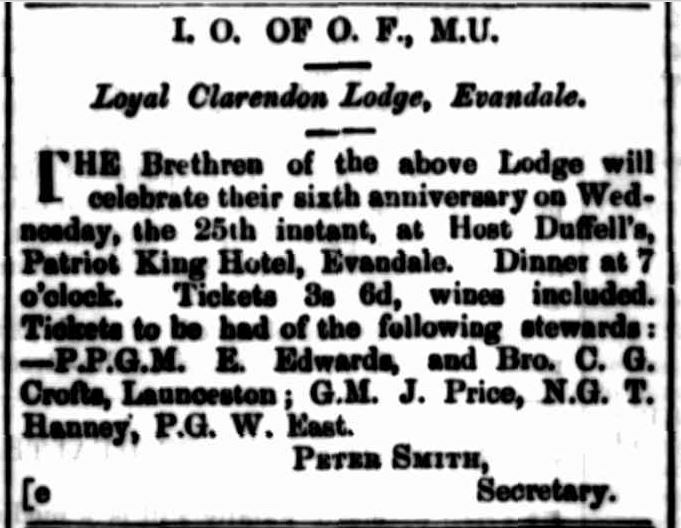 On the first general lodge night in October 1850, the following were elected members for the purpose of opening a lodge at Evandale :-J. Green, J. Wrench, W. J. Gable, T. Tarry, J. Sleeson, J. Griffiths, S. Long, T. Phillips, Thomas Hanney, and John Duffell, (hon. M.), at whose hotel, The Patriot King, the lodge was opened on October 24 by the then P.G.M. Bro. W. Stroud. Thos. Fall One more of our oldest residents gone over to the majority. He arrived in the colony from New South Wales in 1832. 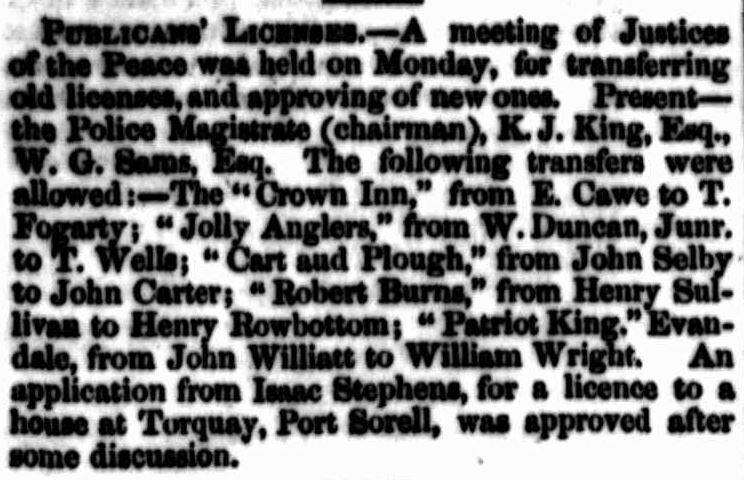 Turning to an old file of the Launceston Advertiser, I find he commenced business as a baker in Charles-street, on a site where Messrs; Hunter and Dunning are now erecting a coffee-palace and shops. His neighbours were Alex Stewart, who kept a licensed public-house, and on the other side G. Gooch, chemist. He afterwards moved into St. John-street next door to the Criterion Hotel, where an insurance office now stands. He retired from that to enter into the business of a licensed victualler. The first house was at Franklin Village, and thence he moved to Evandale, taking the house known as the Patriot. King. Afterwards he built that substantial house where he died, the Clarendon Hotel. This house has always been conducted more like a family hostelry than an inn, and it was a favourite resort of bridal parties. In building up a well-earned competency Mr. Fall was materially assisted by his able partner, and in commemoration of her memory (she belonging to the Jewish faith), Mr. Fall some time ago renovated the Synagogue in St. John-street. He was in his time a large employer of labour, and was a just paymaster. This entry was posted in Evandale, Hotel and tagged location, photo by Xenith. Bookmark the permalink.